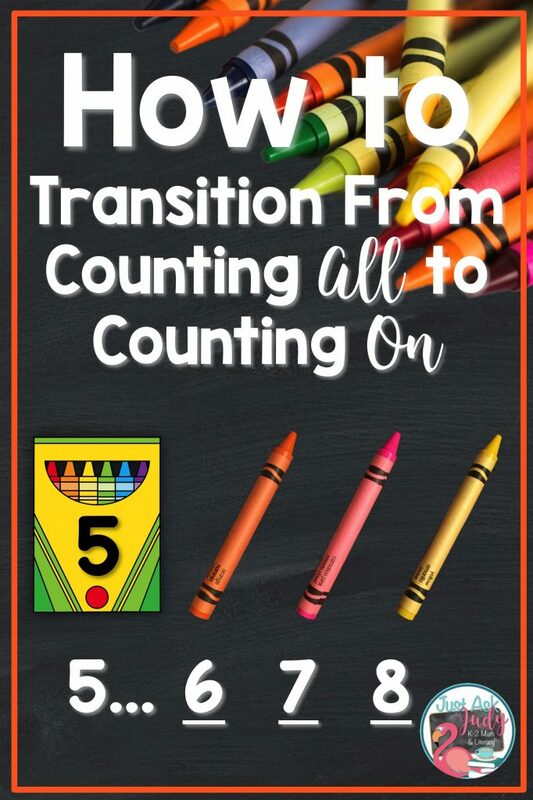 Are you wondering when or how to transition your students from counting all the numbers to counting on or up from the first or greater number when adding? Counting on is typically one of the first addition fact strategies to be taught. Children progress developmentally from counting objects and fingers to counting abstractly; from counting all to counting on from the first number, then from the greater number. I found a vertical number path and the concept of counting up to be beneficial for my students. You can also use a horizontal number line and the concept of counting on for everything in this post. I encourage you to use the method that works for you and your students! You provided experiences to help them develop a conceptual understanding of addition through the manipulation of concrete objects in the context of problem-solving. You helped them discover the number combinations or bonds for a given number, at least to 10 (i.e. 0 and 5, 1 and 4, 2 and 3 make 5). Your students are fluent in saying the forward number word sequence to at least 10 if not 20. They can count forwards from a given number, although some may still need a number line for support. Your students can assign cardinal meaning to the first addend. They understand that counting 7 objects and saying the number 7 to represent a set have the same meaning. I know you have seen numerous addition activities and games that use dominoes, playing cards, or two dice with pips. 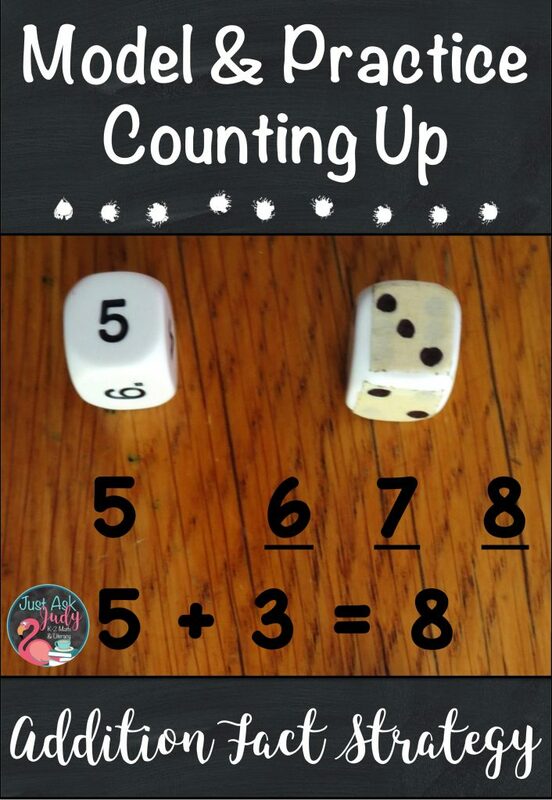 These are wonderful ways to develop an understanding of addition but when it’s time to transition to counting on, these activities might encourage your students to continue counting all. Instead of using two dice with pips, use one die with numbers 1-6, 0-9, or 0-10. Modify the second die with pips by covering four, five, and six with masking tape and drawing another set of pips for one, two, and three or draw the pips for one, two, and three 2 times with a permanent marker on a blank die or wooden cube. Now, your students will be encouraged to count on/ up from the first number. Some students will still count abstractly by starting with one, even without seeing a set to count. Using a number line to start counting from the first number can be helpful. Use a set (or two) of number cards along with the ace, two, and three from a deck of playing cards. 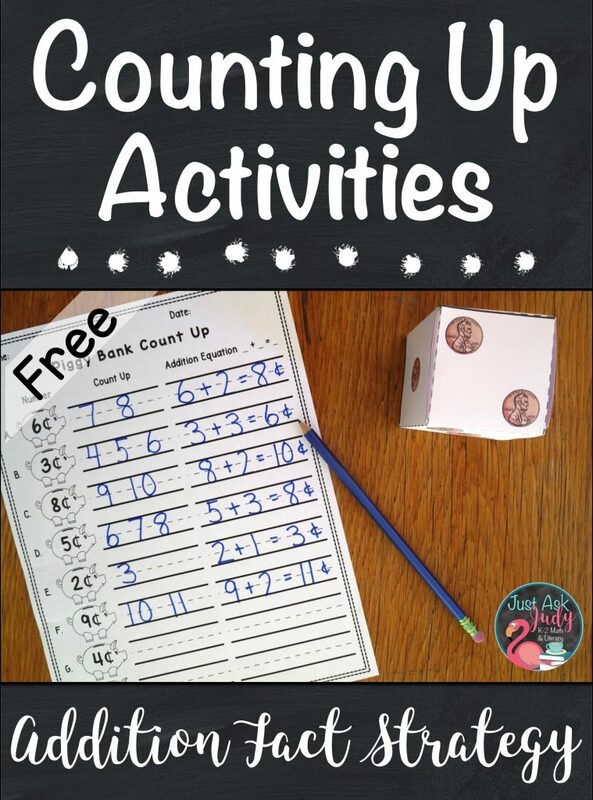 Use any number cards (2-9) that you already have on hand or print the ones in this free Activities for Counting Up download. 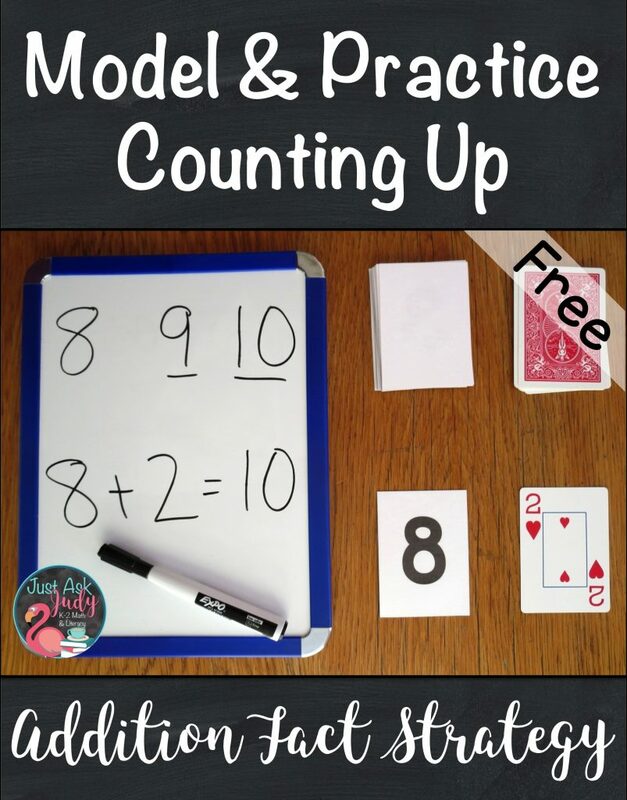 Students can pick a number card and a playing card to practice counting on from the first number. They can also write the numbers counted on a whiteboard or piece of paper. You might want them to draw lines for the numbers counted on as placeholders. They can also write the corresponding addition equation. 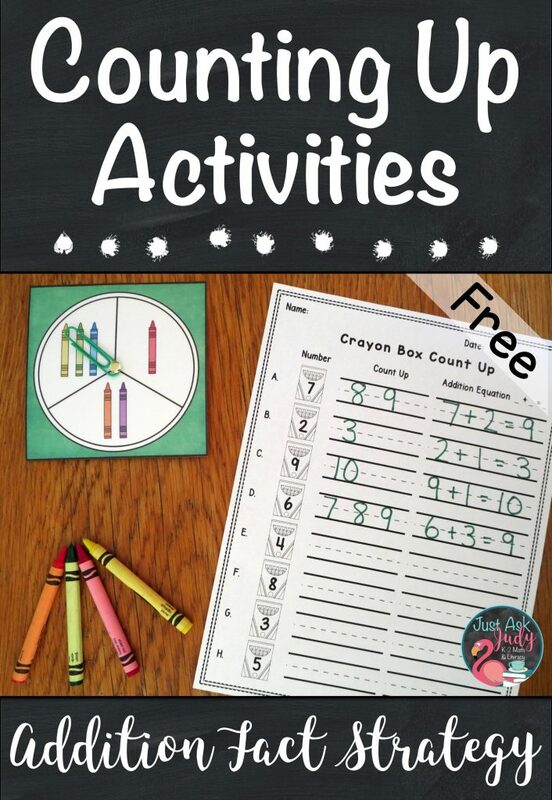 Use the crayon box number cards, also included in the free Activities for Counting Up download, and sets of one, two, or three crayons in the same manner. Use the penny or crayon dice or the spinners to count up from a given number. This activity can be completed by one student or by a small group taking turns. Roll or spin. Count up that many times from the number given on the recording sheet. Write the numbers. Write the addition equation. The recording sheets may also be used on their own by asking your students to count up an assigned number (one, two, or three) from each given number. These activities are perfect for teacher modeling, small instructional groups, or independent math stations. 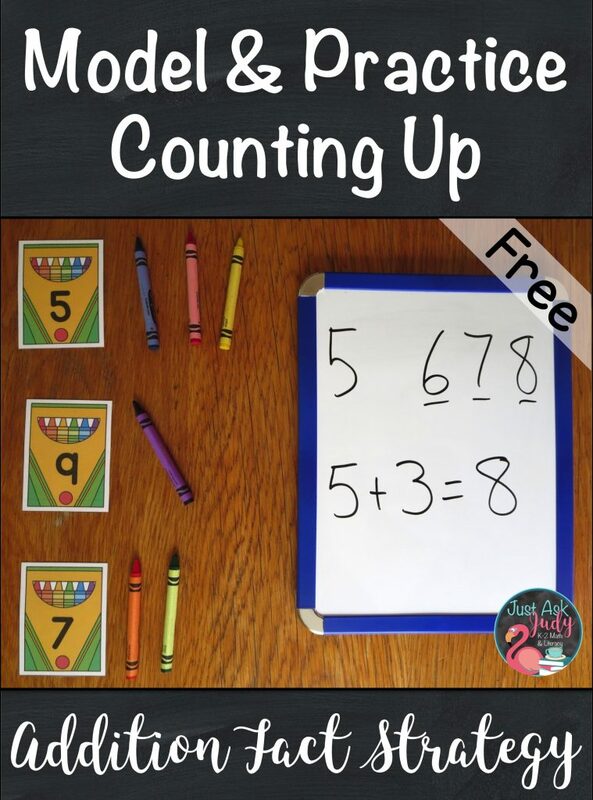 What are your favorite activities for teaching or practicing the count up addition fact strategy? Check out my newest addition fact strategy resources, available for purchase in my Teachers Pay Teachers store. Piggy Bank Count Up is the perfect activity for practicing the count up addition fact strategy in kindergarten or first grade. Spin to Win- Ladybug Addition has a game mat for each of my addition fact strategies, making it an ideal resource for helping to develop fact fluency in first and second grades. Credits for crayon photos in blog title image: Westmoreland Learning and Snapshots and Smiles. Thank you for this post. It is very insightful.